When the specter of crushing college debt and a jobless future aren’t enough to frighten the next generation, there’s Robert De Niro with the final warning all grads have been waiting to hear. 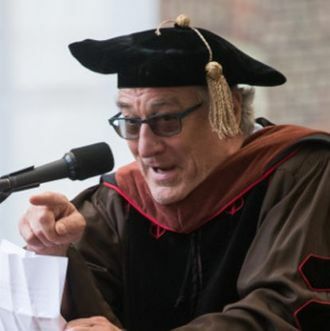 Speaking at Brown University’s commencement ceremonies over the weekend, where he received an honorary doctorate of fine arts, De Niro likened the America the class of 2017 is about to graduate into to a box-office bomb that has just seen its collective Rotten Tomatoes score plummet. “In movie terms,” he said, the America that used to be an “inspiring, uplifting drama” has now become a “tragic dumbass comedy.” One not even worthy of a Razzie. “Work for the change. Work to stop the insanity. Start now so the class of 2018 will graduate into a better world,” he advised this year’s graduates. But no pressure, kids. De Niro, who’s never had a kind word for Donald Trump, also called the president an “idiot” and his presidency “nightmarish.” Cheers to the beginning of the end!